Yesterday morning on Twitter Aviva Dunsiger and I had a very professional conversation about teaching writing. It started because as much as I like the idea of a Bump It Up Wall, I struggle with it too. For me I feel my most important duty as a grade one teacher teaching writing is to teach my students how to become writers, authentic writers. I put more focus on making them life long writers, than working through the requirements of our curriculum. It is not to say that I don’t teach our required curriculum. That simply is not true. However I do choose very deliberately how I will cover the government curriculum while keeping my focus on creating authentic writers. For me the curriculum per say is just a requirement of my government, but the need to help my students become authentic life long writers is my real purpose as their teacher. This concerned Aviva a lot because it was difficult for her to see how I was meeting my curriculum requirements. How was I getting data? How did I know if my students got it? These are all very fair questions to ask. This blog is designed to look at how I meet the different curriculum requirements while keeping my goal of creating authentic life long writers at the forefront. In my twenty years of teaching I have learned that when you foster a classroom that allows children to explore their own interests they do just that. But they are curious learners, and when you get excited about a new form of writing, they are curious to give it a try too. 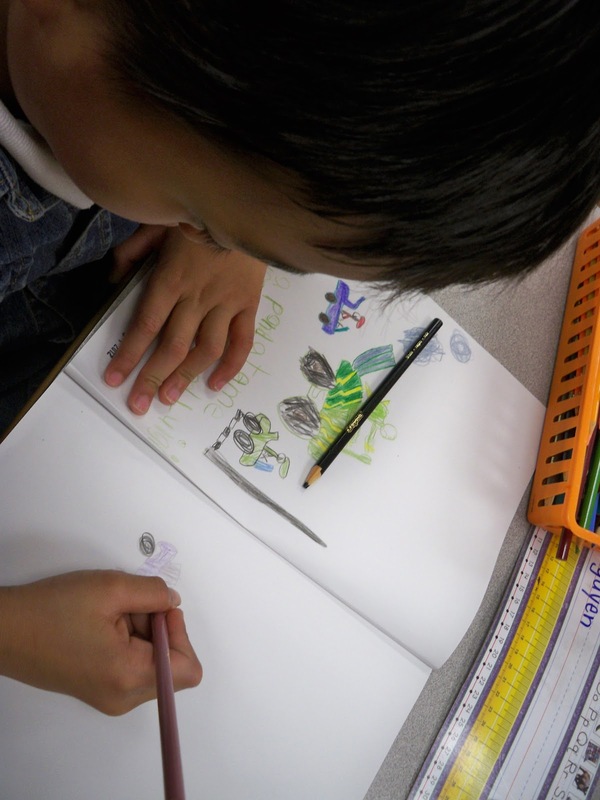 In British Columbia, at the grade one level, there are ten main Prescribed Learning Outcomes (PLOs) for writing. They can be found here. The writing requirements start on page 19 and are labelled C1-C10. Before I start talking about how I meet each specific PLO I should tell you about some of the ways I teach writing in my classroom. To begin with my students journal first thing in the morning, three days a week. I do not assign them a topic but have specifically chosen Monday and Friday as journalling days because they usually have something to share about their weekend, or about their school week. Tuesday's writing is tougher for some but I have plenty of places to find ideas to write about or a quick chat with a friend can help too. What's important is that they come up with the final decision on what they are going to write about. For some of my students they would prefer to blog, which is a completely acceptable choice at this time. Choice in both choosing a topic, and choosing the means to journal is very important in meeting my goal of creating authentic writers. While they are doing their planners, changing their home reading books, and practicing their word work I am busy conferencing with as many as I am able during this time. Usually I can managed three conferences, sometimes more, sometimes less. When I fall behind I'll conference with students while they are journal writing too but I try not to do that too often. During one on one conferences we talk about strengths, and areas for improvement. We set goals, or work on ways to continue to improve goals we are working on. In the second term I introduced an editing checklist that my students are encourage to use. Sometimes I take the lead in the conferences but just as often the students take the lead. They are pretty good at telling me what they are good at doing, and what they would like to get better at. But it really does depend on the student. We always review goals, and when necessary set new ones. It's a really focussed time. The teaching is very specific to each student's needs. I try to record information discussed during these conferences either right in their journals, or in their writing conference books. Sometimes though I must admit that I do forget to document our discussions. This is something I need to get better at. But these conferences happen, and happen regularly and they are a vital part of my writing program. Most mornings we choose a special person. As a class we do a shared piece of writing that is about the special person. During this time I model writing for my students. Each round of "special person" has a different writing focus. 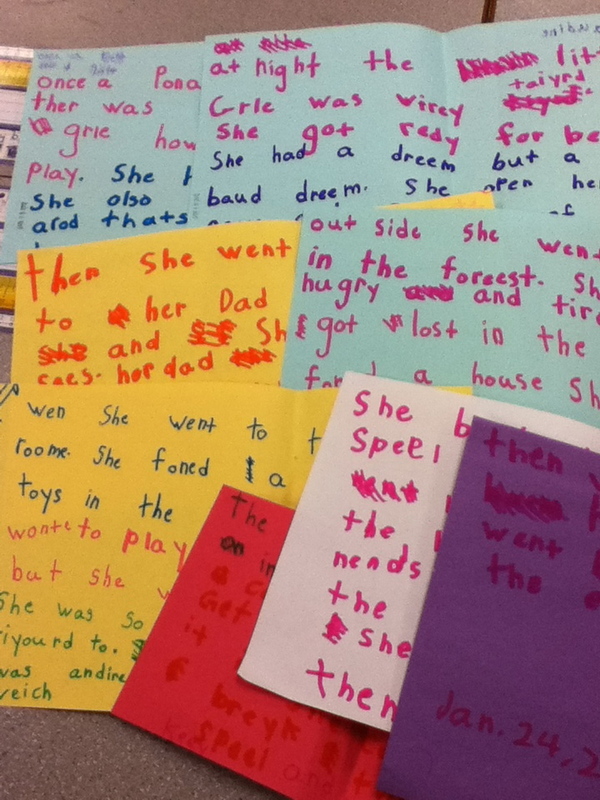 I have used the special person story to teach my students about writing multiple sentences on a topic, adding details to sentences, setting goals, writing name poetry, and using language of sequence. We've covered mechanics like capital letters, punctuation, and simple and complex sentences. While the children think that we are just writing fun stories about our classmates, each round of stories has a purpose in my writing program. When my students are writing I continue to conference. 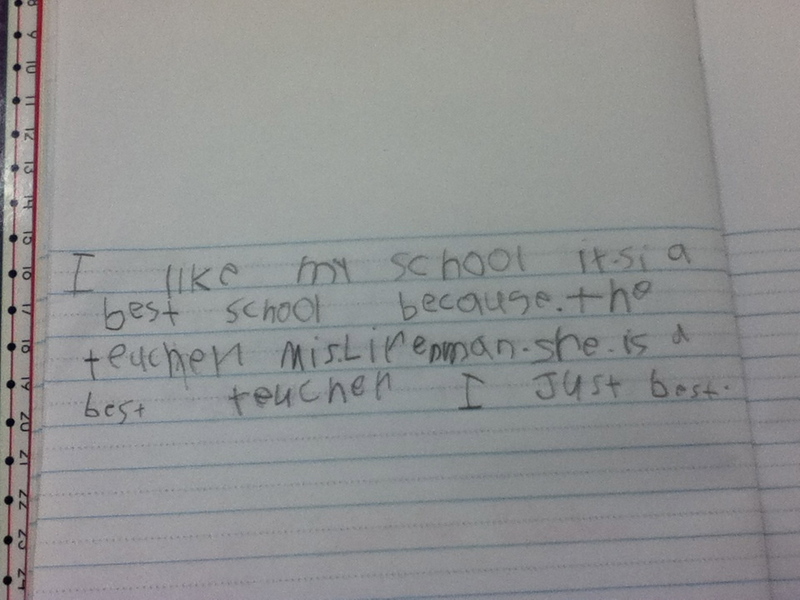 While conferencing I often have a few students that are still working near/with me on their writing. They know that my conferences are my number one priority during this time, but I also know for some of them just sitting near me helps them stay focussed on their writing. I love my rainbow table. It's perfect for this. At the end of writing time we meet back as a group for writer's share. I must admit this doesn't happen as often as I'd like it to and I need to find a better way to make sure it happens. But when it does happen my students volunteer to share their writing with the class. I keep a list of who shares, and when I have a few left that haven't shared I gently remind/encourage/tell them that they will be sharing. As a class we provide feedback, feedback that is specific. I encourage my students to use words like "I like the way you..." or "I noticed that you...". I model too of course. At times have used the inside outside circle strategy so that everyone can share their writing. I think I need to do that more often. On Thursdays we head to the computer lab for blogging or story writing As you've probably figured out I have two computers and one iPad in my classroom that my kids can write on. I usually have more kids wanting to write digitally, than places for them to write so having lab time during my writing time ensures that all my students can get on line to write at least once a week. Sometimes I have kids who don't want to write or create using Storybird so they add comments to blogs instead. It's funny actually because they will say that they don't want to write but they want to comment. You'd think they'd figure out that commenting IS writing. I certainly won't be the one to tell them. I am lucky at my school to have access to 18 MacBook laptops. 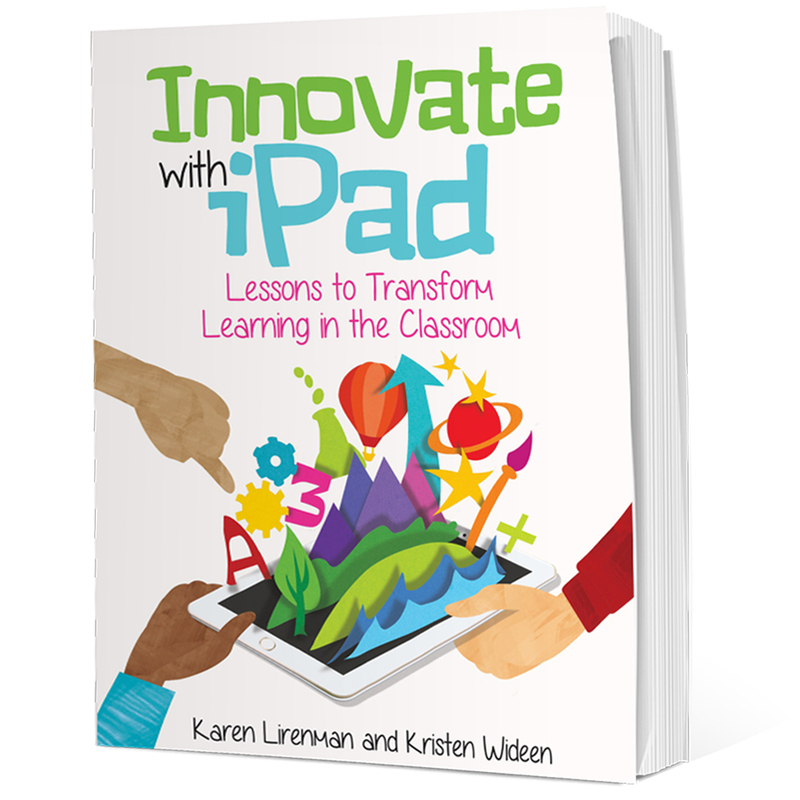 I book them often too (when the intermediate teachers aren't using them for projects). My students love writing on the laptops and I love being able to provide the opportunity to use them. It's a win win for all involved. Friday mornings, and more frequently during our Quad Blogging we read and comment on other classrooms blogs. During this time my students help me compose comments to leave on other blogs. They tell me what to write. We use this time to practice our editing skills too. They are great at finding my typos and telling me how to correct them. To them they are just writing comments, but my goal here is to give them the opportunity to write for a purpose, reread their work looking for errors, and correct those errors. Because we are regularly commenting on blogs, we are regularly editing as a class, and in turn they are better at editing their own work. We write in other areas of our day, but my focus then is typically more on the content I'm trying to teach then the mechanics of their writing. This is not to say that I don't remind them of what good writing looks like but content is the goal during this time. Now that you know a little bit about how I cover writing I'll try to show you how I meet my required curriculum. I spend a lot of first term focusing on strategies to help my students organize and expand their writing. One resource I’ve relied heavily on this year is No More I’m Done by Jennifer Jacobson. I love the mini lessons she uses for the first month of writing. For me though those lessons were more of a first term focus than first month focus. We looked at writing from artifacts, writing from memory, adding meaningful detail to writing, focusing on one specific topic using the binocular strategy, and writing from webs. By teaching these strategies in term one, and re visiting them over, and over, and over again my students were able to demonstrate competencies for this required PLO. I saw proof of this in their three day a week journal writing, their personal blogs, and their free choice writing. I also had several 1-1 conferences with my students throughout term one where we were able to discuss this requirement. I feel very confident that I have adequately covered this PLO, and it is one that we continue to cover all year long. This PLO is introduced in term three through our science focus of plants and animals. I have set the stage for this writing by focussing exclusively on non-fiction text during our guided reading sessions. My students are now very familiar with different aspects of non fiction text so when they start writing non fiction I feel confident that they will be successful. This non fiction writing will be integrated into our science blocks although from past experience I feel pretty confident that my students will start demonstrating their knowledge of non fiction writing during their free writing time too. During our Fairy Tale unit in January we talked a lot about story features, and about Fairy Tales in particular. We thought about different endings, and what secrets the author uses to keep us wanting to read more. We read different versions of the same story and compared and contrasted how they were similar and different. It is at this time of the year that my students are encouraged to write their own stories, and you know what, they do! During free write they are writing their own version of stories that they have read or heard. If someone chooses not to we conference about how I need to see that they can write a story. More often than not this isn’t necessary. So as far as my students are concerned they are writing creative stories because that’s what they want to do, not because I’m telling them to. It’s actually quite sneaky. The next three PLOs all focus around using strategies for a variety t purposes and I will speak to each of these together. If you reread how I described my writing program it should be pretty obvious that I cover all three of these PLOs on a regular basis. I constantly teach a variety of writing strategies, I meet regularly with my students to discuss their progress, and I help them set new goals for improvement. These goals are specific to the needs of each student. I look for their use of strategies in their writing. When I don't see what I'm looking for we talk about it, I reteach it, and I let them know that I'm looking to see it. That's the beauty of having one on one conferences with my students. We can use our time together to meet needs that need to be met. Every student in my class gets there one on one time with me. 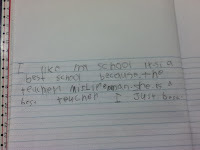 My students' writing often contains personal opinions on a specific topic. In addition frequently during content areas my students have to respond to what we are doing or learning. I must admit we do spend a lot of time talking about likes and dislikes and perhaps we could write about them more often. Thankfully I still have another term to ensure that this PLO is met successfully. C8 It is expected that students use writing and representing to extend their thinking. This writing is a very specific type of writing and does need to follow a specific lesson. We do a TON of talking around extending thinking with the think, pair, share strategy. We do write this too, and often we do it during a reading block ( to extend thinking regarding a reading concept) or a socials or science block. This is very important writing, so much so that we have used our "writing block" specifically for this type of writing. And yes, while I know my goal of our daily writing block is to create authentic writers, sometimes the curriculum is the main focus of my students' writing. This PLO is easily met during 1:1 writing conferences. It also met when we "blog around the world". We look at writing samples, we talk about what we like about them. We do a ton of turn and talk focussing on this concept. But a lot of the time this PLO is met during conferencing. I can't stress enough how powerful these conferences are. They provide a clear picture of what my students are thinking. The conventions side of writing is covered all the time. My students know that if their work is hard to read, it is hard to understand, and if it is hard to understand they lose their voice. They work hard to master a large range of writing conventions and when they get stumped by one, I'm there to help them master it. By do means does this mean that my students are perfect writers, but they do know what they need to do to make them better writers. This, like so many of the other PLOs mandated by my provincial government, is taught and retaught all the time. So is my writing program perfect? Certainly not. I still have things I struggle with and I know there are many things I could improve. Which brings me back to the Bump It Up Wall that Aviva talks about. I love the idea behind that wall and I think for many of my students it would be a fantastic tool to help them improve their writing. But this year I have another group of students that I worry about, and specifically I worry about how the wall would affect them. In other years that Bump It Up Wall would be a perfect tool to add to my room, but this year my gut is telling me (based on what I know about my students) that it isn't the time for this. Who knows though. When my class starts writing non fiction it may be something I (or my student teacher) reconsiders. I also worry about my four ELL students that receive pull out support. They are not in my classroom during our morning journal time. They aren't getting as much writing as I'd like them to get and I need to find a way to fix that too. I also struggle with having my students want to publish their work. Most just want to write, and write, and write. Few want to create published copies of their work - published can take on many forms. Mind you they do spend a lot of time (and focus) on their initial drafts. It is something I'm looking at tweaking and perhaps it is a goal for term three. 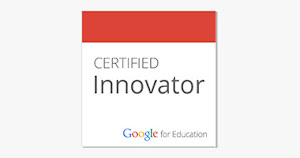 At this stage in the year I know my students are ready for this next step. So how does my writing program compare to yours? What do you think I should add to what I'm already doing or do you think I should remove parts of what I do? As always, I'm curious to hear what you have to say. Karen , I love the details in this post! You certainly give you a far better appreciation of what your program looks like and how you meet the multiple curriculum expectations. Ours vary slightly from yours, and there are certain text forms that we must teach our students how to write in the different grades. While our current TLCP's focus on these forms, they don't always do so. The funny thing is that while we do have slightly different views on certain things (such as the Bump It Up Wall or expecting students to write using a given form at a given time), we actually have far more things in common with our program. I run Writer's Workshop in the same way as you, and I also do the morning journaling activity. Various tools are also part of my writing program, and students often choose the tool that they want to use. Your post really helped me see these similarities, but also appreciate the differences. Thank you for always being the "critical friend" that constantly helps me learn and grow as a teacher. I really appreciate it! Thanks Aviva I appreciate your feedback. As you know I feel super strongly that my job is to encourage my students to be authentic writers. We often talk about what an author does, and how they do their writing. I'm glad that forms aren't mandated to the extent that they sound like they are for you but I do teach specific forms and my students do write with specific forms too. I'm not saying that forms are not important either. But sometimes I do question why grade one students need to fully master a certain form. In my opinion young students need to gain confidence to write. If they don't get that when they are young I'd think it would be that much harder to get when they are older. Each level of learners are different and I really think K/1 learners need to play with language like they do with most other things in their lives at their age. Too much structure kills that play. Karen, I think that for me, it's more about balance. I want my students to work and come to really appreciate different writing forms, but I also think that they can "play" given the confines of any form. What I often do is teach a form, get students writing using this form in a meaningful context bur on the topic of their choice, and then add in old forms, and give students choice about which ones they choose to use. Things may be different there, but at my school, a lot of the students leave Kindergarten just comfortable writing sentences in a journal. I want them to see that writing is about more than just journal writing. If focusing on some different text forms helps students see this, then I see this as success. All that being said, if I didn't have eager and engaged writers, I wonder if I'd feel differently on this topic. I think that I would. In that case, I'd probably introduce forms (like you), but not mandate that they write using specific ones (also like you). Another way, I guess, that students and student needs really do drive both of our programs. Thanks for helping me think more about this topic! The one thing that I think you may not realize is that most of my students do use the variety forms I teach. They are curious creatures and want to play with the forms as they get to know them. I also think the ones that don't really aren't ready for them yet, which is an interesting thing for me to say as I am ALWAYS encouraging my students to am high, take risks, and go beyond what they think they are capable of. That is specifically built into the classroom environment that I set up. However, I realize that you guarantee that all of your students use the variety of forms. It is something for me to think about. I do see where balance is important too and my students do use a variety of specific forms during of socials and science times too. There I do explicitly direct them as the purpose of our writing is specific and it is content driven. I just don't want to do that during our official written block. In either case, like we've both agreed upon before, we are putting our student's learning first. As I said on Twitter to an administrator in my district, my goal is to put my students at the centre of their learning and this is how I choose to do it. I'm pretty certain you have a similar goal as well for your students and you achieve it in a manner that works best to you. Isn't that what good teaching is all about ? As you've heard over, and over, and over again from me, thanks for pushing my thinking to places I never thought I'd go. Twitter, and conversing with people like you, has been by far the best professional development of my career. Thanks for the reply, Karen! I have some students in my class that would not choose to write using certain forms unless being explicitly asked to do so. I also have others that would choose on their own (and do experiment more readily), and with these students, I do give them a little more choice in form. Again, like you, I think it's about knowing your learners and doing what's best for them. This is certainly something I see in what you do. For me, it is a balance between expectations, keeping with what my grade team partners are doing (something that's very important at my school), and providing enough choice that students have control over their learning too. You're continuing to inspire me about more ways to do this! Thanks again for your feedback Aviva. One of our major differences is that I do not have expectations to teach specific forms to my grade one class. If I did my teaching would have to be different. But I don't and I am happy about that. I can focus my attention on creating authentic writers and be less concerned, at this level, of teaching and expecting specific forms. While we have different mandates from our governments or schools, we are doing our very best to meet them keeping our students first. That is what matters most.